Photographed for her 100th birthday in 2012, Marian Busey posed before a display of her works in the Arati Artists Gallery. 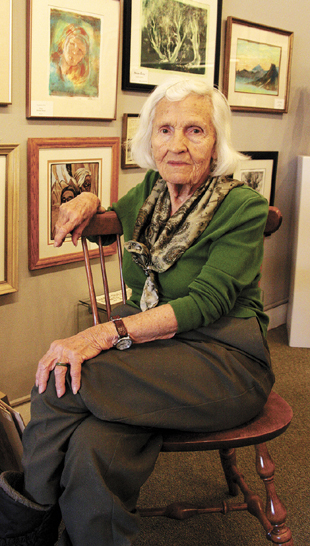 Marian Claire Busey, who helped found Old Colorado City's Arati Artists Gallery, died June 2 at the age of 106. A visitation at Blunt Mortuary is scheduled Wednesday, June 6 from 5 to 7 p.m. Graveside services are Saturday, June 9 at 10 a.m. in Crystal Valley Cemetery. Marian was born March 24, 1912, on an Ohio farm “without running water or electricity,” her obituary states. She later earned a master of arts from Ohio State University and taught art in public schools. In a 2012 Westside Pioneer interview marking her 100th birthday, Marian explained that she especially liked painting, but was having to turn to different media because macular degeneration was affecting her eyesight. She is survived by her son, Philip Busey; and her granddaughter, Katharine Busey. Marian Busey's version of famous Colorado City madam Laura Bell. Marian and her husband Jim, a college professor and World War II veteran whom she'd met in Mexico, were married for 65 years before his death in 2007. The couple moved to Colorado in 1952 and to Colorado Springs (eventually Manitou Springs) in 1965. 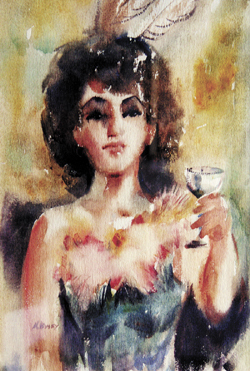 Marian “joined up right away” with area art groups, she recalled in her 2012 Pioneer interview. This included becoming president of the Colorado Springs Art Guild. It was through the Guild that the idea took shape for an artist cooperative, the Pioneer article reports, and this became Arati in 1977. Marian elaborated that she was one of the original 15 artists who joined forces to lease the building at 2425 W. Colorado Ave., where the co-op continues to this day. “I was the first den mother,” she joked.